In 1213, the Bishop of Como, Lord and Master of Vallugano sold his property in Ciona and the mountain known in ancient times as “Bellenio” to the Chapter of San Lorenzo in Lugano. In those years, at the top of the mountain there was already a small chapel dedicated to San Salvatore (hence the name). The canons of San Lorenzo soon turned it into a small church. Reference to the church’s original appearance dates back to 1414: a piece of parchment kept in the archives at the municipality of Carona, describes: “A white mountain against a shady blue backdrop. On the summit the church of San Salvatore with its steeple”. During the Feast of the Ascension in 1680, the Chapter of San Lorenzo transferred ownership of the church and the summit to the Confraternity of St Marta and the Good Death. After 23 years, in 1703, the Confraternity decided to demolish the original church and to build a new one. The following year the foundations were laid and in 1719 the building works were completed. In 1722 it was decided to complete the building beneath as a residence with a tavern next to it in order to set up an “inn”. Over the last two centuries the history of the area has provided us with a wealth of information on the many efforts made by the Confraternity and later the Funicular Company as, respectively, the owner and guardian of the site. On 26 March 1890 the Funicular began operating, and in 1943 the Lightning Research Centre was set up whilst in 1969 Swiss Post Office television and radio antennae were erected. Last but not least, in 1999 the two organisations established the San Salvatore Museum, illustrating the proactive role they both still play. Around these important structures, year after year, the Confraternity managed to enrich and beautify the church on the summit. It became a focal point for the faithful and of great significance for the entire Lugano area. This was reconfirmed in 1900 with the erection of a huge iron cross, historic testimony to the importance of the mountain for the Funicular Company and the Confraternity of St Martha and the Good Death. 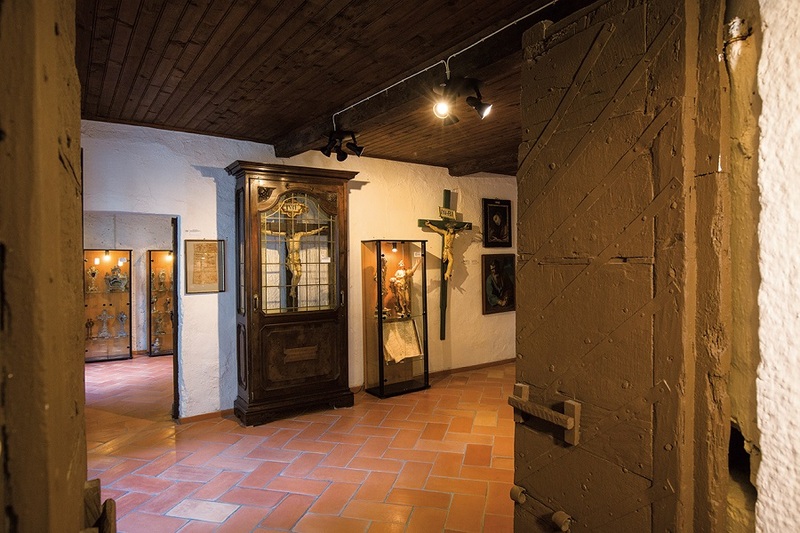 The ancient rooms of the San Salvatore Museum present a very particular and largely unknown chapter in the religious history of Ticino and that of the Lugano area in particular. The School of Saint Martha, established in 1513 as a devotional order, is now referred to as the Archfraternity of Good Death and Prayer. The garment originally worn by the members of this brotherhood was a cloak of coarse white cloth cinched with a belt. The Brethren’s faces were completely hidden by their hoods, which had just two holes for their eyes. They wore this garment to accompany those condemned to death on their final journey and during solemn processions held in and around Lugano. Over the course of the centuries, the Archfraternity undertook a wealth of great deeds, underpinned not only by their faith but also by noble and humanitarian causes, encompassing all charitable deeds to ease physical and spiritual suffering. One particular and very important deed undertaken by the Brotherhood was that of accompanying individuals condemned to death to the gallows. This final act came after three days of care, during which the Brethren of Saint Martha gave succour and comfort to those whose earthly life was about to end. After the execution, by hanging, drowning or even decapitation, the body was made presentable again by the Brethren, who also performed the religious rites and burial. As it has done for centuries, the Archfraternity today carries out a host of activities, its good work over the ages documented in the archives. The Brotherhood operated from the Church of Saint Martha within the hospital until the latter was demolished in (1914), later moving its headquarters to the present-day church of Saint Anthony in Lugano. On July 10th, 1680, the Chapter of San Lorenzo donated the Church of San Salvatore to the Archfraternity, which still owns the church today. Each year the impressive oratory hosts the celebrations for the feast of the Ascension, an event attended en masse by the Brethren and the faithful from all over the Lugano region. The Archfraternity also owns the building which houses the Museum, known as the “Old Hospice”, which in olden times offered shelter to travellers and the poor and was used for spiritual retreats by the Archfraternity itself. The museum is home to an impressive collection of rare and precious objects collected over the course of the centuries, proof of the Archfraternity’s long-standing devotion to religious and humanitarian work. In the small museum, some of these treasures are on public display in order to highlight and perpetuate the Brethren’s good work.